Yes, he can be a bit over-dramatic at times, but that probably just balances out my own very lax attitude. You guys? I had no idea Cole couldn’t breathe for over a MONTH. So probably it’s a good thing that Dr. Andy is looking out for my kids. 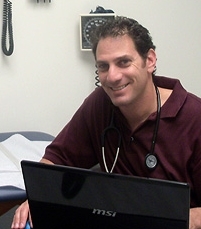 Dr. Andy was the mohel who performed Cole’s bris, he came to our house for Cole’s first newborn well-care visit & Lulu’s first weigh-in or two, and he hosts a patient picnic/barbecue every spring. His waiting room (which we never actually have to wait in) is stocked with toys, and is consistently reachable to answer questions or concerns. He spends time getting to know each of his patients, and can confidently discuss the merits of each of the muppets on Sesame Street (Big Bird is his favorite, he feels that Grover is something of a whiner, and Elmo is a Johnny-come-lately). He has no patience for the books that mimic Dr. Seuss’s style, but are not actually by Dr. Seuss. He is not a dog person, but we try not to hold that against him. …so we’ll let him slide on this whole “Failure to Thrive” nonsense. We loved Dr Andy. He is a little quirky but that’s part of his charm. He truly cares about his patients. Loved that he did house calls for the first three months. Loved that he never made me feel stupid as a new Mom. I miss him! (Please say hi to him on your next visit!). I felt bad because after the Failure to Thrive post it seemed like I threw him under the bus – we like him so much! I will tell him you said hi! I don’t think you threw him under the bus. You can disagree with your dr. He said Cade had a really large head- which I disagreed with. He has a thing with heads. 😉 But I don’t think that makes him any less of a great pediatrician. It just makes him Dr Andy.